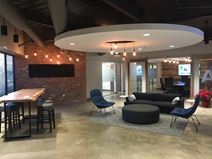 Featuring an urban industrial décor this modern office space is located on the Blue Valley Parkway in Overland Park, a short walk away from the Rosana Square Shopping Center. A range of coworking memberships, dedicated desks and private offices are available, along with conference rooms for up to 12 and large event space for up to 200. Great for individuals and small teams who are looking to be in a collaborative and energetic environment. Offices start at $800/month. Primarily set up for teams of three - eight people the private office spaces at this center are spacious and fully furnished. Located in the heart of Overland Park it is easily accessible and benefits from great road links. The regional transport links are also exceptional and provide all tenants and visitors with a multitude of frequent and convenient transportation services in operation both locally and regionally. This location was designed to incorporate productivity and top rated customer service. The goal of this location is to help you grow your business by providing you with the essential tools needed for success. Located in the heart of the Overland Park area, this center offers access to many of the city's best restaurants, shopping centers, bars, parks and local activities. Well lit parking allows visitors to feel safe coming to and form the office. At this location, you will find premium office suites that come fully furnished and ready to go once the lease is signed. This center offers flexible leasing terms that will allow you to upgrade as your business grows. All inclusive pricing is standard at this location, ensuring that everything needed is included in the monthly fee. Located near many of the area's local parks, restaurants and shopping centers. Rental space now being offered at Overland Park in Kansas City close to the telecoms giant Sprint. 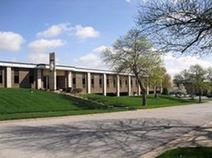 This facility is based in central College Blvd’s Business corridor and offers easy access to the Kansa City via the I-435. This is an excellent and iconic centre for sales professionals and come fully equipped with all the modern amenities. This office park encompasses a well designed business centre that offers a quick drive to Downtown City and to nearby Leawood. Virtual office are offered if requested and executive suites are offered unfurnished and come with AV technology, high speed internet and telephony access, 24 hr access and security, receptionist cover, admin services with the use of the Xerox Machine and wireless services. Situated in a well planned business district, this centre is situated on beautiful and tranquil settings offering easy access to and from the Airport. Minutes’ to banks, hotel accommodation, restaurants and cafés. These offices are well designed and fully furnished and offer a professional reception making this an ideal business environment. Service space now available at Overland Park business centre, providing excellent conference room facilities that can accommodate large groups and well equipped office suites. The centre is serviced by helpful and knowledgeable support staff. The centre offers easy freeway and other transport access to the Sprint Campus and to many nearby shopping and dining amenities. This exquisite and exceptionally professional business center location provides a significantly wide range of contemporary and luxurious office suites to rent close to the Metcalf Shopping centre at the Windmill Village office park. This is an older establishment but has been managed and kept well since there are many small businesses in this facility. The surroundings are beautiful and offer peaceful and maintained landscaping. The offices range in size and price, therefore it is advisable to ask.